A proton is an example of a baryon. 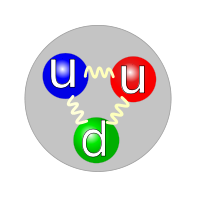 It is composed of 2 up quarks (u) and 1 down quark (d). The term baryon usually refers to a subatomic particle composed of three quarks. A more technical (and broader) definition is that it is a subatomic particle with a baryon number of 1. Baryons are a subset of hadrons, (which are particles made of quarks), and they participate in the strong interaction. They are also a subset of fermions. Well-known examples of baryons are protons and neutrons, which make up atomic nuclei, but many unstable baryons have been found as well. Some "exotic" baryons, known as pentaquarks, are thought to be composed of four quarks and one antiquark, but their existence is not generally accepted. Each baryon has a corresponding antiparticle, called an anti-baryon, in which quarks are replaced by their corresponding antiquarks. The term baryon is derived from the Greek word βαρύς (barys), meaning "heavy," because at the time of their naming it was believed that baryons were characterized by having greater mass than other particles. Each baryon has an odd half-integer spin (such as 1⁄2 or 3⁄2), where "spin" refers to the angular momentum quantum number. Baryons are therefore classified as fermions. They experience the strong nuclear force and are described by Fermi-Dirac statistics, which apply to all particles obeying the Pauli exclusion principle. This stands in contrast to bosons, which do not obey the exclusion principle. Baryons, along with mesons, are hadrons, meaning they are particles composed of quarks. Each quark has a baryon number of B = 1⁄3, and each antiquark has a baryon number of B = −1⁄3. The term "baryon" is usually used for triquarks, that is, baryons made of three quarks. Thus, each baryon has a baryon number of 1 (B = 1⁄3 + 1⁄3 + 1⁄3 = 1). Some have suggested the existence of other, "exotic" baryons, such as pentaquarks—baryons made of four quarks and one antiquark (B = 1⁄3 + 1⁄3 + 1⁄3 + 1⁄3 − 1⁄3 = 1)—but their existence is not generally accepted. Theoretically, heptaquarks (5 quarks, 2 antiquarks), nonaquarks (6 quarks, 3 antiquarks), and so forth could also exist. Besides being associated with a spin number and a baryon number, each baryon has a quantum number known as strangeness. This quantity is equal to -1 times the number of strange quarks present in the baryon. The octet of light spin-1/2 baryons. The rules for classification are defined by the Particle Data Group. The rules cover all the particles that can be made from three of each of the six quarks (up, down, strange, charm, bottom, top), although baryons made of top quarks are not expected to exist because of the top quark's short lifetime. (The rules do not cover pentaquarks.) According to these rules, the u, d, and s quarks are considered light, and the c, b, and t quarks are considered heavy. Baryons with three u and/or d quarks are grouped as N (isospin 1⁄2) or Δ (isospin 3⁄2). 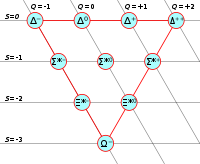 Baryons with two u and/or d quarks are grouped as Λ (isospin 0) or Σ (isospin 1). If the third quark is heavy, its identity is given by a subscript. Baryons with one u or d quark are placed in the group Ξ (isospin 1⁄2). One or two subscripts are used if one or both of the remaining quarks are heavy. Baryons with no u or d quarks are placed in the group Ω (isospin 0), and subscripts indicate any heavy quark content. Some baryons decay strongly, in which case their masses are shown as part of their names. For example, Sigmas (Σ) and Omegas (Ω) do not decay strongly, but Deltas (Δ(1232)), and charmed Xis (Ξ+c(2645)) do. Given that quarks carry charge, knowledge of the charge of a particle indirectly gives the quark content. For example, the rules say that the Σb contains a bottom and some combination of two up and/or down quarks. A Σ0b must be one up quark (Q=2⁄3), one down quark (Q=−1⁄3), and one bottom quark (Q=−1⁄3) to have the correct charge (Q=0). The number of baryons within one group (excluding resonances) is given by the number of isospin projections possible (2 × isospin + 1). For example, there are four Δ's, corresponding to the four isospin projections of the isospin value I = 3⁄2: Δ++ (Iz = 3⁄2), Δ+(Iz = 1⁄2), Δ0(Iz = −1⁄2), and Δ−(Iz = −3⁄2). Another example would be the three Σb's, corresponding to the three isospin projections of the isospin value I = 1: Σ+b (Iz = 1), Σ0b(Iz = 0), and Σ−b(Iz = −1). Baryons that are composed of at least one charm quark are known as charmed baryons. Baryonic matter is matter composed mostly of baryons (by mass). It includes atoms of all types, and thus includes nearly all types of matter that we may encounter or experience in everyday life, including the matter that constitutes human bodies. Non-baryonic matter, as implied by the name, is any sort of matter that is not primarily composed of baryons. It may include such ordinary matter as neutrinos or free electrons, but it may also include exotic species of non-baryonic dark matter, such as supersymmetric particles, axions, or black holes. The distinction between baryonic and non-baryonic matter is important in cosmology, because Big Bang nucleosynthesis models set tight constraints on the amount of baryonic matter present in the early universe. ↑ The Particle Adventure, Hadrons: Baryons and Mesons. Retrieved September 10, 2008. ↑ Hyper Physics, Baryons. Retrieved September 10, 2008. ↑ M. Roos and C.G. Wohl, Naming Scheme for Hadrons, J. Phys G 33:1. Retrieved September 10, 2008. Cottingham, W.N., and D.A. Greenwood. 2007. An Introduction to the Standard Model of Particle Physics, 2nd edition. Cambridge: Cambridge University Press. ISBN 978-0521852494. Griffiths, David J. 1987. Introduction to Elementary Particles. New York: Wiley. ISBN 0471603864. Halzen, Francis, and Alan D. Martin. 1984. Quarks and Leptons: An Introductory Course in Modern Particle Physics. New York: Wiley. ISBN 0471887412. Martin, B. R. 2006. Nuclear and Particle Physics: An Introduction. Chichester: John Wiley. ISBN 978-0470025321. Povh, Bogdan. 1995. Particles and Nuclei: An Introduction to the Physical Concepts. Berlin: Springer-Verlag. ISBN 0387594396. Veltman, Martinus. 2003. Facts and Mysteries in Elementary Particle Physics. River Edge, NJ: World Scientific. ISBN 981238149X. The Review of Particle Physics. Particle Data Group. This page was last modified on 13 May 2016, at 20:51.